Aviation Mastery or Minimum Standards . . . What’s Your M.O.? 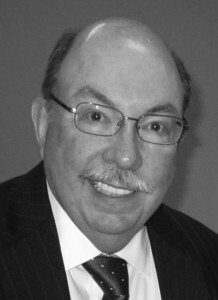 Publisher Note: I’ve known Jim Lara for some time since we work together on the NBAA Single Pilot Working Group trying to tackle the challenge of reducing the accident rate for people who fly business airplanes alone. Like me, Jim believes that our training system, used to qualify pilots to minimum standards set forth by the FAA, is flawed. I too am frustrated working with people in all aspects of our industry who believe “good enough,” is just fine. Here’s how Jim explained it. When was the last time someone in the aviation profession asked you (or you asked yourself) “Is this good enough?” What does “good enough” really mean, anyway? In my opinion, the very question constitutes an attitude of mediocrity. The real question for aviation professionals should be: “Is good enough ever really good enough in any business or private aviation pursuit? So many times, we use the descriptive phrases “world-class,” “best-in-class” and “excellence.” But do we really mean it or is it simply “ear candy” because it sounds good? In the realm of professional aviation, each of us carries a mantle of tremendous responsibility for the other souls with whom we share the airspace, our families and colleagues, our companies and employers and, of course, ourselves. The consequences of a serious misstep in our profession can have a finality that renders the statement, “I will do better next time” meaningless. Given those stakes, to what level of performance should we aspire? Perfection? No, by definition perfection is simply unreachable. An industry colleague of ours, President of Mastery Flight Training Tom Turner, has described a standard that is arduous and demanding, yet achievable. He refers to it, simply, as mastery. One of the highlights of this concept is that it can be applied to each and every one of our roles in aviation—as maintenance technicians, flight crew members, schedulers and dispatchers, business office specialists and leaders. 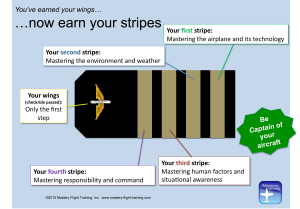 Tom’s graphic (right) likens mastery to “earning your stripes.” The concept, of course, is that you move up the chain of command as you master each step. In practice, we have seen that’s not always the case. The unfortunate reality is that aviation operational standards have been put forth as minimum standards. As you already know, this terminology is in standard usage for everything—from FBO leases with the local Airport Authority to pilot type ratings for today’s most sophisticated business jets. Let me interject a true story here: Just a few weeks ago, I was present in one of our industry’s leading Part 142 training facilities. There were about a dozen full-motion simulators booked around the clock. The classrooms were fully outfitted with the latest interactive learning tools. And there was a top-notch resource library staffed by a pair of professional librarians, eager to help with any conceivable research request. For those who’ve completed a few years of recurrent training, I’m sure that conversation sounds pretty familiar. If we truly think of ourselves as aviation professionals, what level of performance comes along with earning that title? I argue that it is mastery and mastery alone. That means having a profound understanding of all of the relevant subjects in your area of focus. And it means understanding all of the whys—not just the hows. And, finally, it means being able to mentor, teach and communicate your invaluable understanding and experiences to those individuals who are in the developmental years of their careers. I believe that each of us in an aviation organization should be a leader. And it is up to each of us to set the standards of aviation mastery; first for ourselves, and then to influence the adoption of those standards throughout each of the functional areas in our respective organizations. It’s not easy. Without a doubt, the performance bar to reach the mastery level is ever higher. As we learn more, and perform at higher levels, the horizon of possibility and performance will always stretch out in front of us—always just a little out of reach. But as we learn more, we understand more. And as we understand more, we become more valuable to our organizations. When that happens on a consistent basis, our business aviation organizations can create more quantifiable value for their host organizations. When we attain that level of performance, sustainability of the business aviation function is within reach. But the quest for mastery must continue all the same. Well, one thing is for certain: “good enough” certainly isn’t mastery! And, if it isn’t mastery that we’re aiming for, can we rightfully refer to ourselves as “aviation professionals”? After all, mastery is the cornerstone of aviation professionalism. Has Technology Killed the Art of Flying? This entry was posted on Thursday, February 25th, 2016 at 2:07 pm	and is filed under Aviation Education, Aviation Marketing, operations, Safety, The Buzz. You can follow any responses to this entry through the RSS 2.0 feed. Both comments and pings are currently closed.